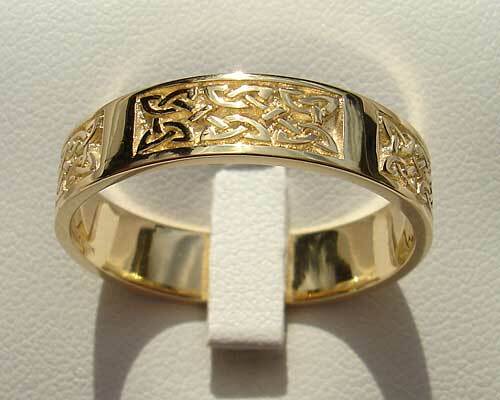 Scottish Gold Celtic Wedding Ring : LOVE2HAVE in the UK! 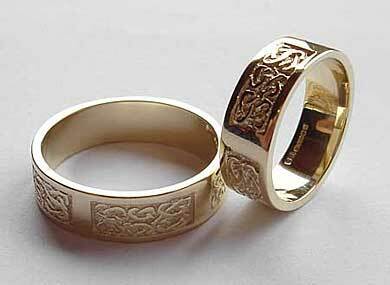 A traditional Scottish Celtic wedding ring in 9ct yellow or white gold. The Celtic knot chosen for this ring sits in rectangular panels repeated several times on the rings outer. Celtic knot patterns symbolise the Yin and Yang in nature, a symbol that originates from other civilisations. 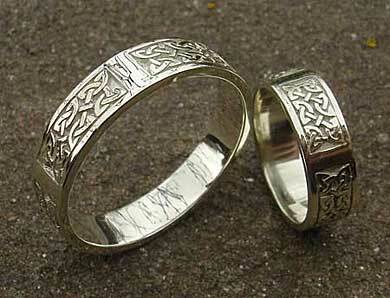 The ring is approximately 6.5mm wide and makes a fantastic idea for a traditional Celtic wedding rings set. We have pictured it below in a white, and a yellow gold set too. The white gold is in its natural pale yellow colour.